What if it was your job to scuba dive with octopuses? Well, for Chelsea Bennice, aka OctoGirl, this is very much a reality. Growing up in Ohio on the edge of Lake Erie, Chelsea’s connection to the water started early, but it wasn’t until a marine biology class in high school that she really fell in love with the idea of studying the ocean. After some time spent researching freshwater species, Chelsea eventually made the shift to saltwater where she was introduced to the incredible group of animals known as Cephalopods (octopus, squid, cuttlefish, and nautilus). 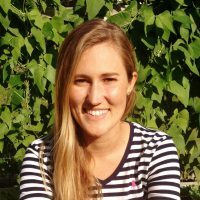 Today, Chelsea is a PhD student at Florida Atlantic University researching the behavioral ecology of octopus in South Florida. 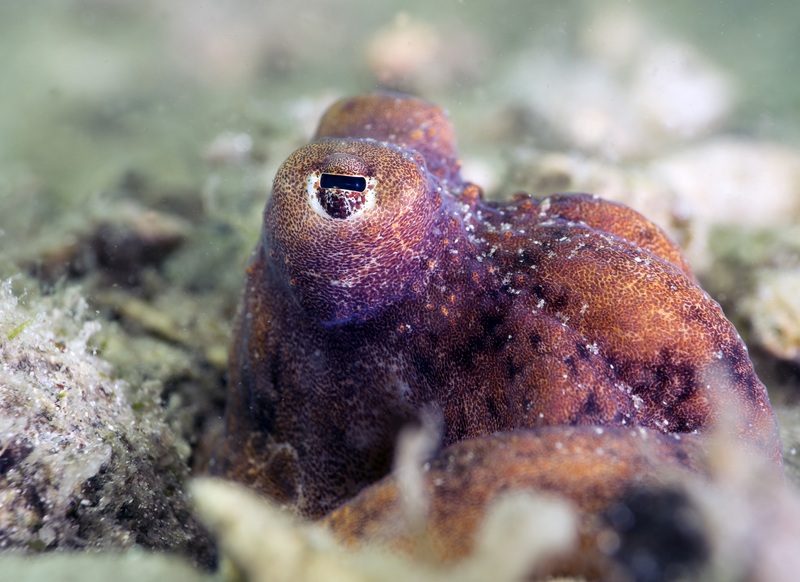 A Common Octopus swims along the bottom, underneath South Florida’s Blue Heron Bridge. Photo taken by Chelsea Bennice while studying the behavioral ecology of octopus as part of her PhD research. Like most Marine Biologists, Chelsea collects her data and makes observations out in the field. This means that a lot of times the ocean is her office. Being a proficient and experienced PADI® certified scuba diver (as well as an AAUS certified Science Diver) is imperative in Chelsea’s line of work. 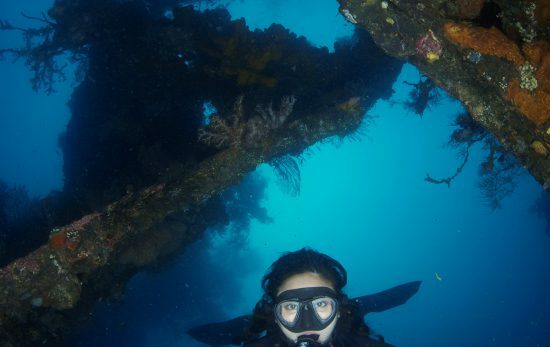 She’s often diving three to four days a week at her study site, Blue Heron Bridge, which is one of Florida’s most well-known shore dives due to the abundance and variety of marine life found there. 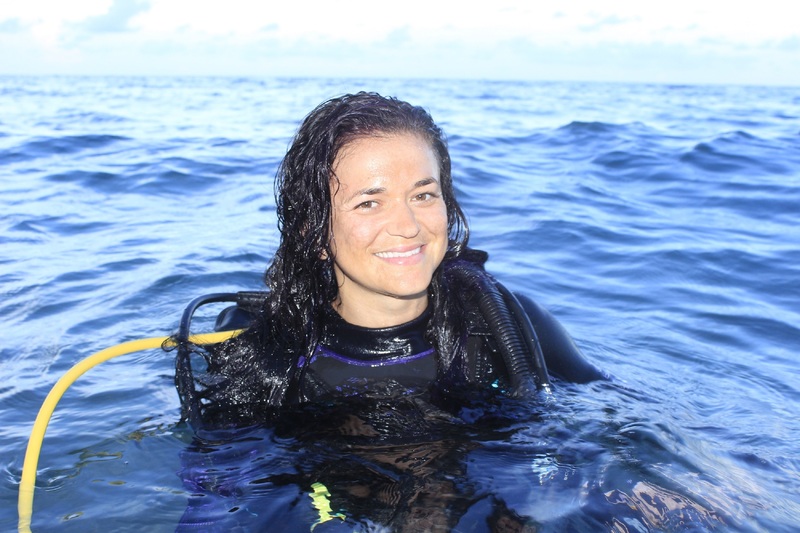 Chelsea Bennice, aka OctoGirl, uses scuba diving to study octopus species in South Florida. Photo by Dana Pearl. 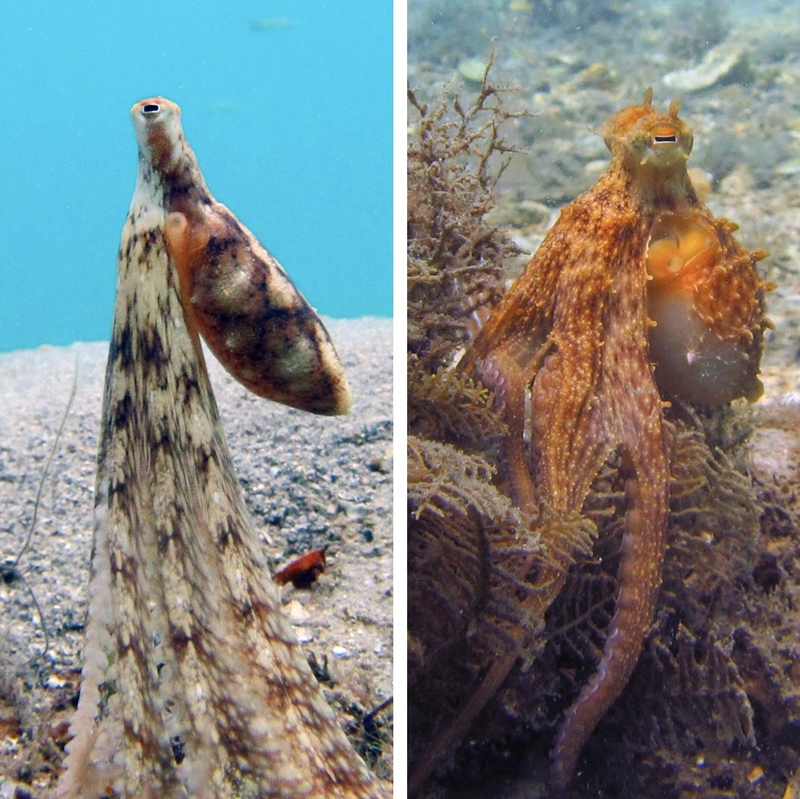 Where exactly are these two octopus species living? How close are they to one another spatially? What do each of these octopus species use to make their dens? Are they using the same or different materials? What do these two octopus species eat? Are they going after the same or different prey species? When are the octopuses active/come out to find prey? Are they foraging at the same or different times of day? The Atlantic Longarm Octopus (left) and the Common Octopus (right) are the two octopus species that Chelsea studies. Photos by Chelsea Bennice. 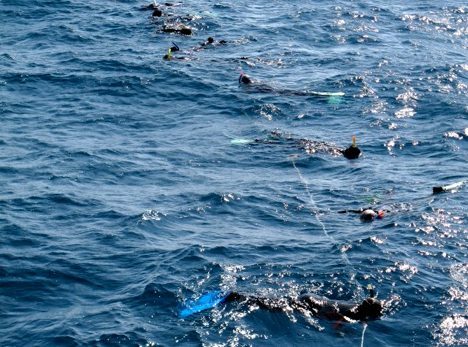 In order to answer these research questions, Chelsea uses a variety of methods and materials while scuba diving in the field. First and foremost, she uses underwater cameras to collect photo and video footage of observed octopus behaviors. She also uses a GPS to mark the coordinates of each occupied octopus den she finds, noting the species inhabiting it. Once she finds an octopus in its den, she uses a quadrat (a standard size square frame with four identical sections) to determine what type of materials the octopus has used to make its home. Wanting to also observe the octopuses throughout the day and night, Chelsea developed a novel approach to monitoring octopus activity, foraging time, and behavior with a 24 hour camera system she calls an OMG (Octopus Monitoring Gadget). OMGs are made up of a GoPro camera with extra battery packs and a red LED light inside of a protective housing. Chelsea places them on the seafloor with the camera pointed in the direction of an octopus den, presses record, and then comes back to retrieve the OMG 24 hours later. Going through this footage not only helps Chelsea to answer elements of her research questions, but also reveals some very surprising octopus behaviors, like unexpected interactions with predators and prey. One of Chelsea’s most notable OMG recordings so far showed a cormorant (a diving marine bird) making multiple predation attempts on an octopus, with the octopus defending itself by swatting at the bird with its arms. 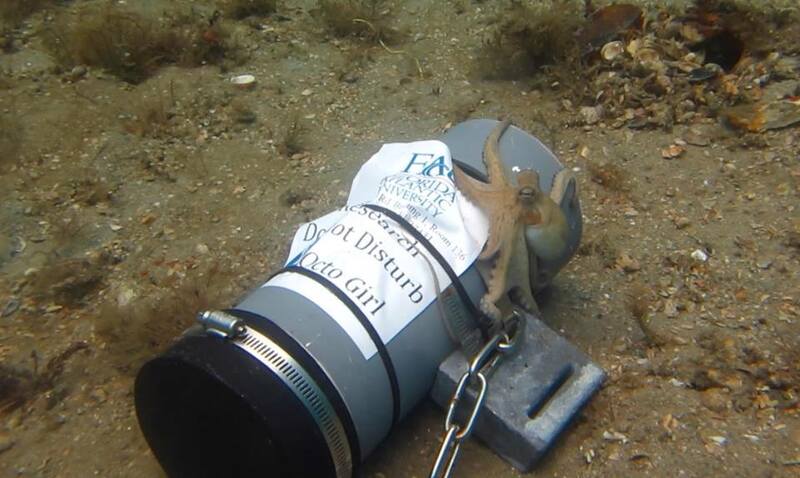 This OMG (Octopus Monitoring Gadget), placed on the seafloor near an octopus den in order to record 24 hour video of the behavior and activity times of the octopus, caught the attention and curiosity of this common octopus. Photo by Chelsea Bennice. With her PhD research nearly complete, Chelsea has been able to uncover some truly amazing results in response to her research questions, as well as document some unexpected observations. The bottom line is that these two octopus species are successfully coexisting in the same small area due to the fact that they are using different resources to make their dens, eating different prey, and foraging at different times. So even though they’re underwater neighbors, there’s very little interaction or competition between the two. Chelsea’s research shows that the Atlantic Longarm Octopus uses mostly sand to make its den, while the Common Octopus will make its den amongst rocks or introduced materials like pipes, glass bottles, or cement blocks. When looking at what these two species are eating, OctoGirl has found that the diet of the Atlantic Longarm Octopus seems to be almost completely made up of crabs, while the diet of the Common Octopus seems to be much more varied, including lots of different types of conchs, clams, and sometimes crabs. Results from the OMGs have shown Chelsea that the Atlantic Longarm Octopus is most active during the day, while the Common Octopus is most active during the night. Chelsea Bennice presenting some of her research findings during a scientific conference. Photo courtesy of Chelsea Bennice. An Atlantic Longarm Octopus peeks out of its den underneath the Blue Heron Bridge in Riviera Beach, Florida. Photo by Chelsea Bennice. 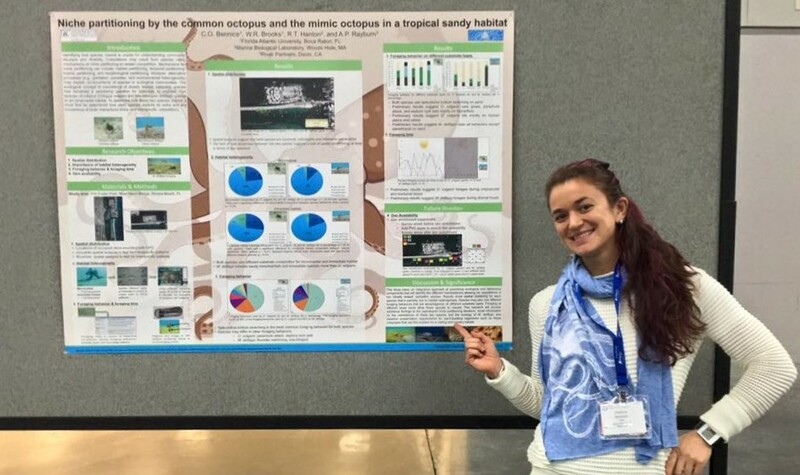 Want to learn more about Chelsea and her octopus research? Follow her on Facebook @OctoGirl, on Instagram @theoctogirl, and listen to Chelsea’s interview episode on Ocean Allison Podcast. 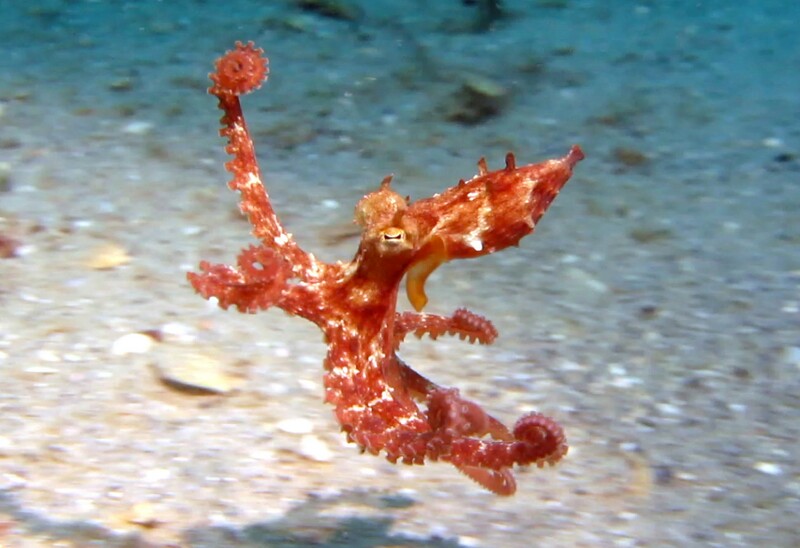 Want to support Chelsea’s efforts to better understand octopus behavior? You can contribute to her research by clicking the “Donate” button on her Facebook page. Additionally, 15% of proceeds from every octopus pin purchased through the FinPinShop is donated to help fund Chelsea’s research. 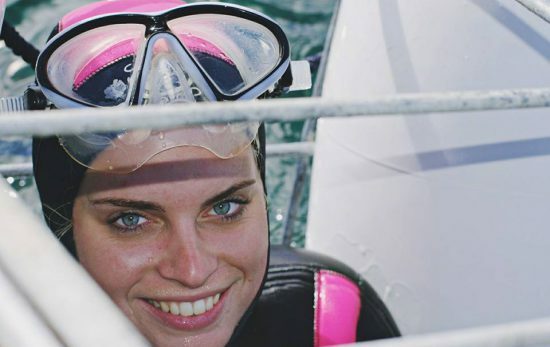 Chelsea is a great example of a young female with a successful and bright career in scuba diving as well as science! Join PADI in celebrating all of the amazing female divers, like Chelsea, around the world on Saturday, July 21st 2018 for the fourth annual PADI Women’s Dive Day. Click here to register for an event near you!